After years of struggling, U.S. miners and steelmakers have bounced back in 2016. Owning a stock whose price skyrockets more than 200% in a year is the dream of every investor. And in 2016, a number of stocks have done just that. But they're not all coming from the high growth industries you might expect. AK Steel Holding Corporation (NYSE:AKS), Coeur Mining Inc (NYSE:CDE), Cloud Peak Energy Inc. (NYSE:CLD), Cliffs Natural Resources Inc (NYSE:CLF), and United States Steel Corporation (NYSE:X) have all more than tripled this year. And there are some broad macroeconomic reasons why. One of the major trends in this group of high performers is that mining stocks are up huge this year -- at least, those mining stocks that survived the year. Iron ore producer Cliffs Natural Resources, gold and silver miner Coeur Mining, and coal miner Cloud Peak Energy have jumped 370%, 277%, and 258% respectively as raw material prices have increased broadly. There are a variety of reasons why commodity prices are up this year, from risk early in the year in the financial system to concern that China's economic growth is slowing. For iron ore, there was a lot of hope that increased tariffs on Chinese steel and/or a decline in production in China's steel mills would lead to higher steel production in the U.S., which would help domestic miners. Tariffs have been an incremental help to the industry, but the pop in these companies' stocks is more a matter of speculation about a brighter future than anything else. 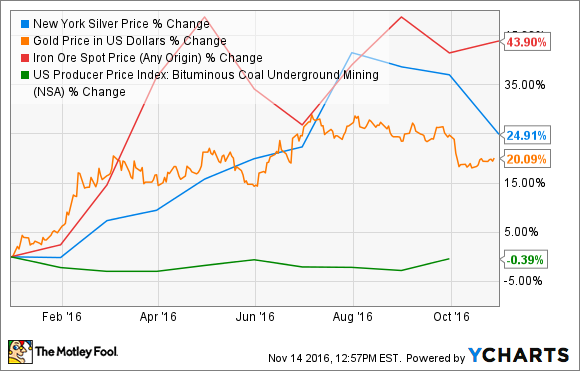 Coal demand is a little more complicated for Cloud Peak Energy. Demand continues to fall both within the U.S. and internationally. And prices haven't seen any kind of recovery either. But Peabody Energy, the largest private coal mining company in the world, filed for bankruptcy this year. As its competitors fall amid financial struggles, the slack could be picked up by the relatively healthy survivors. The move in commodity prices hasn't led to big profits for Cliffs Natural, Coeur Mining, or Cloud Peak Energy, but the companies have gone from losing money to operating at near breakeven levels. And there's hope sustainable profits are on the horizon. That's been enough to get investors betting the future is getting brighter, which is a big improvement after some rough years for the mining industry. Is steel poised for a sustainable recovery? The other major trend on the market is the recovery of steel stocks, particularly AK Steel and United States Steel, which are up 260% and 243% respectively. The rise in these stocks can be directly linked to a reduction in Chinese steel production and tariffs on Chinese steel in the U.S., which I mentioned as reasons iron ore prices are up as well. Tariffs have been an up and down battle all year, as the U.S. has applied them on one subset of products, Chinese exporters have found their way around them, and U.S. manufacturers have asked for stricter tariffs. But the general trend has been Washington moving to protect U.S. producers from subsidized Chinese exports. Both AK Steel and United States Steel recently swung back to profitability, so if tariffs lead to rising steel prices, there could be hope for a brighter future. And that's what investors have been betting on so far in 2016.